There are key maneuvers that can make or break your race. In addition to tacking and jibing, setting the spinnaker is another one. Expert Dave Flynn continues our series with his tips for foolproof sets. In this series, we’ve already covered tacks and jibes. Now for a few words on spinnakers. Fortunately, for the most part, the key principles apply to both asymmetrical and symmetrical spinnakers. For course racing (windward/leewards), the marks will be to port. With the exception of an occasional jibe set, sets will be simple bear aways. That means the gear (halyard, sheets, tack line for asymmetrical) will be to port. I’m a big fan of launching from the forward hatch, just like the big boys do (even on older designs). Everything can be hooked up before the start except for the spinnaker halyard on boats using genoas. For non-overlapping designs, the halyard can be hooked on from the get-go. Secure the tail to a keeper shackle (tape, Velcro, or tie) at the shrouds to keep it out of the way going upwind. If you have a genoa, wait until the penultimate tack to hook the halyard to the head, then caddie it (make sure it doesn’t get hung up on sail or spreader during the last tack). If you have more than one spinnaker, get your tactician/speed doctor to choose a sail before the start. If you’re using a spinnaker pole, it can be hooked to the mast at the base or to a shroud with the afterguy. Have the topping lift and forgery already in place so it’s only a matter of popping the pole into place on the mast and hoisting the topping lift. Always do a practice before the start of a race. It will insure that you have everything hooked up correctly the first time. This is particularly important on modern, high-performance boats with “string drop” systems. Invariably the string for the drop system will wrap around something it is not supposed to. A practice run will help you fix that. Just as “ready about” prior to a tack is not a signal for a mass exodus from the weather rail, getting ready for a spinnaker set only needs minimal movement. The last thing you want to do as you’re struggling to make the weather mark is to have crew out of position and lots of movement. If there’s an offset mark, nothing has to happen until the weather mark is rounded. On symmetrical boats, the only required movement is the bow person moving to get the pole up and the spinnaker pulled to meet the outboard end of the pole. The topping lift can be tailed by the pit person from the weather rail, as can the slack in the afterguy. On asymmetrical boats, only the tack needs to be pulled out to the end of the pole (which may need to be pulled out as well). Again, you only need the bow person and a pit assist pulling from the rail. In light air, pull from wherever you are, but stay out of the way and keep your weight low. There is absolutely no need for any other crew to be out of position. It’s always a big rush to get the spinnaker up, but it doesn’t need to be. Relax. Don’t move until the boat has turned down. The magic moment – when everything should happen – is when it goes flat. Then spring into action. Jump the halyard like a mad man (watching to make sure the sail isn’t hung up and going to rip on something). Take a little tension on the sheet to separate the corners, but don’t pull the clew much past the shrouds. The sheet should be under-trimmed so the sail doesn’t fill on the way up. Trim only once at full hoist. A call of “made” from the person jumping the halyard at the mast is helpful. On symmetrical boats, pull the pole back to target angle as the sail is hoisted. Don’t pull too far aft. With an asymmetrical, be ready to ease the sheet as soon as it fills. It will probably be over-trimmed initially, but don’t worry. The goal is to turn smoothly from close hauled to broad reach. Turn too fast and you’ll end up too deep (with the wind too far aft). The spinnaker will blanket behind the mainsail, twist, and collapse. Turn too slowly and you won’t get down far enough. The boat will heel over, making the spinnaker hard to get up as it fills too early. As with tacks and jibes, there is a perfect exit angle in the middle. Get it right, and the rest of the set will follow. The spinnaker will not fill until the jib is down (or at least eased and completely luffing). The lighter the air, the more important it is to get the jib out of the way. 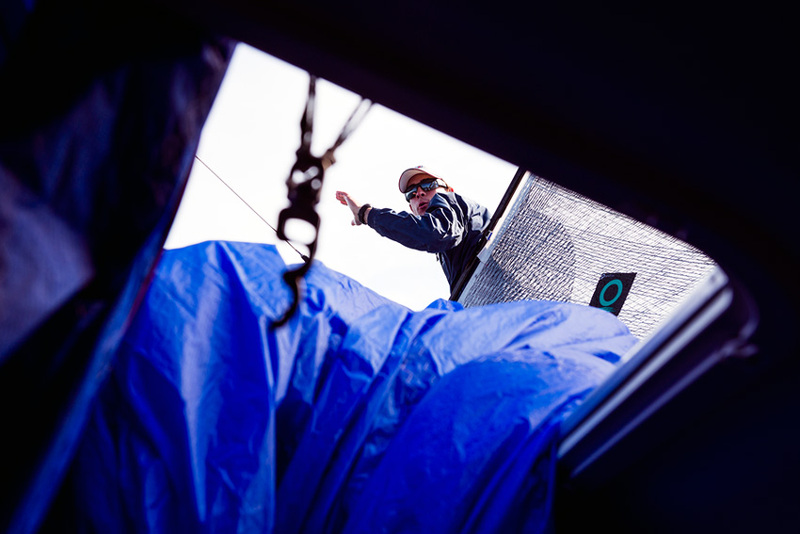 The headsail, however, can be coming down as soon as the spinnaker is more than 75 percent of the way up. In heavy air with a small jib, it’s okay to leave the sail up and keep the weight off the bow while you get the crew in the right places and the boat under control. Just make sure it is well-eased. Movement kills speed. As soon as the sail fills, get in appropriate spots for the conditions: forward and leeward in light air; aft and to weather in more breeze. Then freeze! Settle the boat down. Don’t panic getting the outhaul cunningham backstay off. That can come anytime. If you’ve taken the jib down and want to flake it, wait. For the most speed, freeze as soon as the spinnaker is up and full. Spinnaker sets don't have to be a point of stress or downfall. Prepare, plan, stay relaxed, and let the magic happen! If you'd like to read the other articles in the series on make or break moves, check our our pieces on tacking and jibing.